Consider Invisalign aligners to get the beautiful straight teeth you've always wanted-without braces. A consultation with Dr Rodriguez can determine if Invisalign is right for you. Invisalign uses a series of Invisible, removable and comfortable aligners to move your teeth into the correct position. This means you can still smile confidently during treatment as well as after. Invisalign is made with 3D computer imaging technology that creates individual personalised aligners and it has been proven effective. HOW DOES INVISALIGN® WORK AND STRAIGHTEN TEETH? You wear every set of Invisalign® aligners for about 2 weeks, removing them only to eat, drink, brush and floss. As you replace each aligner with the next in the series, your teeth will move-little by little, week by week- until they have straightened to the final position Dr Rodriguez has prescribed. This technology is truly amazing on how Invisalign® works! You will visit Braces 4U about every 8-10 weeks to ensure that your treatment is progressing as planned. Total treatment time averages 9-15 months and the average number of aligners worn during treatment is between 18 and 30, but both will vary from case to case. Not only the aligners are invisible, they are removable, so you can eat and drink what you want while in treatment. Plus, brushing and flossing are no problem. They are also comfortable, with no metal to cause mouth abrasions during treatment. And no metal and wires usually means you spend less time in our office getting adjustments. Invisalign also allows you to view your own virtual treatment plan when you start so you can see how straight your teeth will look when your treatment is complete. 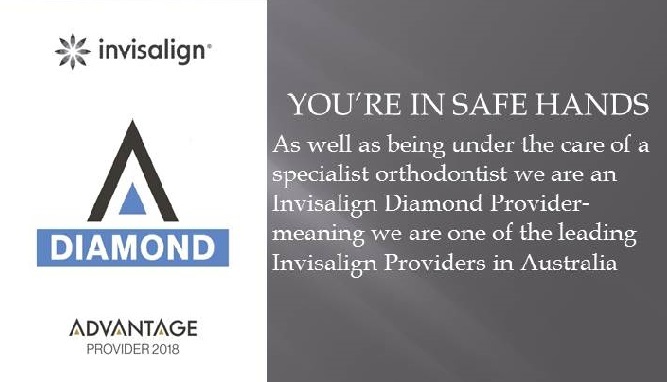 If you have always wanted beautiful straight teeth without wearing conventional braces, you should consider Invisalign® in Mackay with Dr Rosario Rodriguez a certified Diamond Invisalign® Provider. A consultation at Braces 4U can determine if Invisalign® is right for you. Please call our Mackay office on 4840 2832 to have a chat with us. WIll INVISALIGN® WORK FOR OVERBITES OR OTHER COMPLEX CASES? Invisalign® and Invisalign Teen® are as effective as traditional braces treating a broad range of orthodontic malocclusions such as crowding, spacing, midline off centre, narrow smile, overbite, underbite, crossbite, deep bite and open bite can all be treated from anywhere between 9-24 months. Invisalign® has now treated over 4 million smiles worldwide and hence it has evolved to be more than when it was first launched. Expert Invisalign® Orthodontist in Mackay, Dr Rosario Rodriguez has been awarded the Invisalign® Platinum Status in 2016 for being one of the highest Invisalign® treating Orthodontic practices in Australia. Dr. Rodriguez is highly experienced in combining various techniques and modern methods with the Invisalign® clear aligners and braces to get you the best result in a safe, fast and effective manner.